Gravestar (owner of the White St. shopping plaza) will contribute workers and tools; the City of Cambridge will contribute trash bags and gloves, as well as additional tools; and we’ll be joined by upwards of 30 Harvard University student volunteers (and perhaps some from Lesley, too). The MBTA has said it will wash the windows at the T, and both the plaza in front of the shopping center and the T plaza will be power washed. We just need you! Are you a Porter Square Neighbors Association or Agassiz Neighborhood Council member or neighbor? Join those of us who live, work, play, and or worship (St. James Church members are in) along Mass. Ave. for all or part of the time. Having done this a number of times, we can tell you it is obviously work, but surprisingly fun. Folks will stop and thank you; best of all, we will have a better place to live, shop and eat. 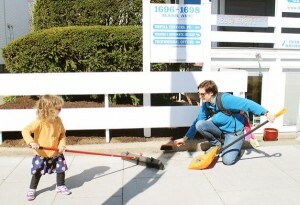 A child’s broom and a child’s snow shovel make an excellent way to get under benches, or in corners. Chopsticks, or bamboo skewers make handy instruments to flick cigarette butts out of crevices.